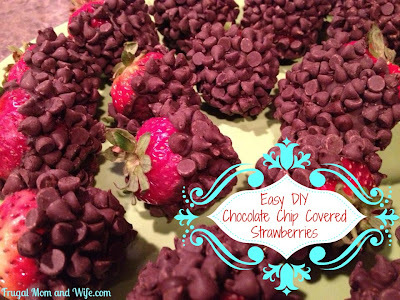 Frugal Mom and Wife: Easy DIY Chocolate Chip Covered Strawberries! Easy DIY Chocolate Chip Covered Strawberries! *STEP 1 - Place chocolate in a bowl set over (not in) a saucepan of simmering water. Stir occasionally, until melted, 3 to 5 minutes. Remove from heat. or place chocolate in a microwave safe bowl in microwave, stir every 30 seconds. *STEP 2 - Line a baking sheet with waxed paper. and place on waxed paper. *STEP 3 - Chill chocolate-dipped strawberries at least 15 minutes to set chocolate. Now you won't be tempted to spend $50+ on those fancy covered Strawberries. This will cost you well under $10 and you get way more! So yummy! OH MY, what a decadent treat! I think I have some berries, but I need some mini chocolate chips. Great idea!